The Samsung GALAXY Note 3 is the most powerful smartphone on the market today, packed with features from the lightning fast hardware to software apps that have been designed to streamline your life. Here we take a look at 10 key points from the GALAXY Note 3's spec sheet and show why it represents the ultimate in smartphone tech. The GALAXY Note 3 is one of the fastest smartphones on the market thanks to its blazingly fast 2.3 GHz Quad-Core processor. Samsung has also thrown in 3 GB of RAM which helps to speed things up and gives apps loads more room to manoeuvre. Having the extra memory and the multi-core processor makes proper multitasking more practical and the Note 3 can comfortably support two apps running at full speed on a split screen in Multi Window. 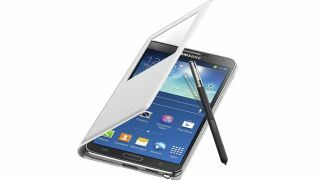 The GALAXY Note 3 runs Google's latest iteration of its Android operating system - Android 4.3 Jelly Bean. Jelly Bean is faster and more efficient at multitasking and offers new features like support for low-energy Bluetooth Smart add-on devices and more useful notifications of things like incoming messages or news headlines. On top of Android 4.3's foundations, Samsung has its own user interface in the shape of TouchWiz - a combination of UI enhancements and tweaks to the OS that both make Android easier to use but also get the best out of the Note 3's unique hardware. The GALAXY Note 3's 5.7 inch Full HD Super AMOLED display has all the room you need to use the web comfortably, watch HD movies and play the latest high resolution games. The Full HD Super AMOLED display gives excellent contrast with deep 'true' black rather than the dark grey you get with LCD displays. Samsung's unique twist on the AMOLED display embeds the touch-sensitive layer into the screen itself rather than using an extra layer on top. As well as reducing the thickness of the screen, this helps reduce the reflectivity of the display and improves viewing in bright sunlight. At 13 megapixels, the rear camera of the GALAXY Note 3 is capable of capturing amazingly high quality images and video. You don't even have to be a professional snapper to get good results as the Note 3's camera app has numerous modes designed to enhance your pics. Beauty Face will flatter your friends by digitally 'cleaning up' their portrait while Best Face take a number of rapid pictures and then lets you digitally combine the shots to show everyone in their best light. There are modes for every occasion from the High Dynamic Range 'Rich Tone' to the quirky 'Golf' which makes taking a photo of a golfer's swing as easy as point and shoot. The video function can capture 1080p Full HD clips at 60 frames per second and if you are willing to drop to 30 fps it can grab 4K-resolution Ultra High Definition movies. Most smartphones make do with a low-resolution camera around the front that allows for grainy video chat or substandard selfies. The Note 3, on the other hand, sports a 2 megapixel camera that will make your Skype chats crisp and your selfies less embarrassing. The GALAXY Note 3's most unique feature is the S Pen. Far from being a mere finger substitute, the S Pen offers precision tapping, drawing and writing on the Note 3's generous screen but is also the key to a number of useful features. Air Command is a floating menu that appears whenever you remove the S Pen from the base of the Note 3 or if you hover the S Pen over the screen while clicking the button on the side. This semi-circular menu is a quick way to call up S Pen-friendly features like the screen annotating app Screen Write and the amazing Pen Window, which lets you draw a box on the screen that will become a multitasking web browser, calculator or other app.